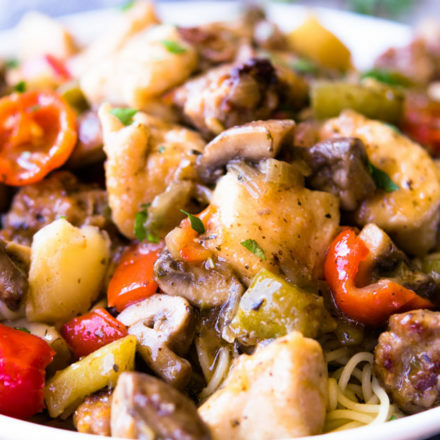 Our Chicken Murphy is an Italian inspired favorite that includes a delightful mix of diced chicken, Italian sausage, peppers, and potatoes combined with a divine sauce made of stock, wine, and pepper brine, and served over a bed of angel hair pasta. Perfect for gathering your family around the table for Sunday Supper! Now, you’re probably going to say at first glance that this Chicken Murphy doesn’t really appear to be an Italian recipe, but I can assure you that it’s at least Italian-American. Recipes that fall into this category have been shaped throughout history by various waves of immigrants and their children, called Italian Americans. These immigrants settled throughout different regions of the United States and brought with them a distinct regional Italian flare. And boy, we’re sooooo glad they did! LET’S BE FRIENDS ON PINTEREST! WE’RE ALWAYS PINING TASTY RECIPES! 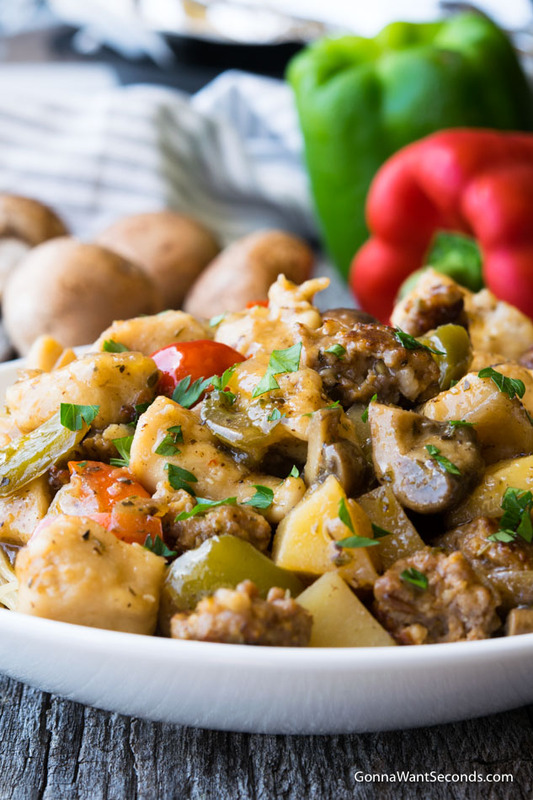 The “Murphy” portion of the recipe is the potatoes, and with the Italian sausage and peppadew peppers, this Jersey Shore classic will quickly become a family favorite. There’s something about the combination – it’s like a flavor trifecta! You will find yourself making it your go-to meal when dinner calls for something special and you have a little extra time to spend making it. And because it’s prepared in one pot – with meats, sides and veggies included – cleanup is quick and easy. 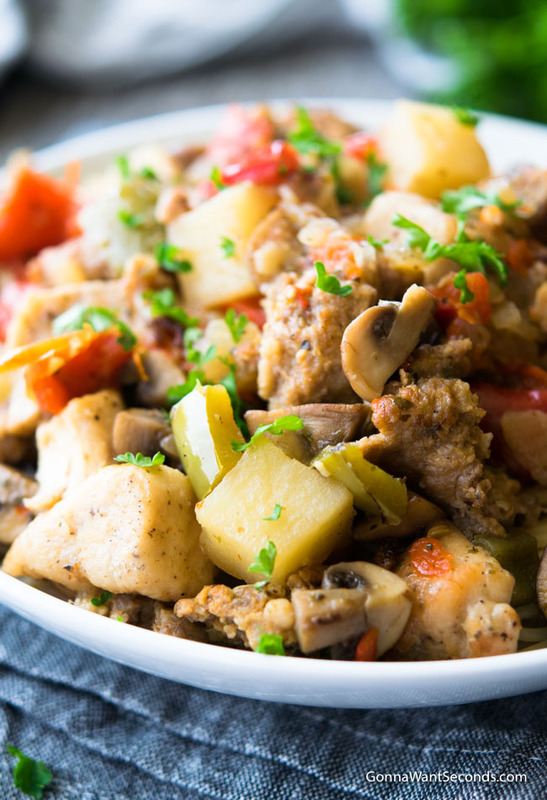 Think about it – how can you go wrong combining chicken, sausage, and potatoes in one dish? Doesn’t adding sausage make anything better? The addition of the peppery brown gravy pulls together a dinner that will leave them yearning for more. And the sweet and sour flavor elements the peppadews bring to the dish is over the top delicious! What are the origins of Chicken Murphy? While some people think the recipe is a spinoff of Papa Murphy’s chicken bacon artichoke pizza, it’s not. And no, it’s not even a version of Papa Murphy’s chicken garlic pizza. In fact, the Chicken Murphy origin is a bit cloudy – it’s supposedly named after a cook or a waiter or a customer named Murphy. It typically includes a chicken breast, which is either breaded (a la Chicken Francaise) or not breaded, sautéed with hot pickled peppers, potatoes, and Italian sausage. Even though we couldn’t find a Chicken Murphy wiki, it’s one of those dishes whose origin can be traced to Italian-American restaurants, mainly in New Jersey. Chicken Murphy is a more brown sauce centric variation of the sausage and peppers that is fairly common to tailgate party cuisine. For people who want some delicious Chicken Murphy, New Jersey is the place to go! Many foodies feel that the Chicken Murphy recipe Belmont Tavern uses is the best they’ve ever had. The tavern never changes, doesn’t take reservations, only accepts cash, and could be from a scene in the Soprano’s. Locals who grew up in the area then moved to the suburbs, come back year after year. How do you make Chicken Murphy? The idea with this dish is to get everything started in a Dutch oven or a large, high sided skillet and then simmer everything together to blend the flavors, reduce the liquid and thicken the sauce. Chicken Murphy in brown sauce uses flour to thicken the deliriously delicious stock, wine and brine combination. While it already includes a carbohydrate with the potatoes, I prefer to serve it over angel hair pasta with a sprinkling of fresh chopped parsley. I mean, can you really ever have too many carbs? We like to call it Chicken Murphy pasta! Rather try a Baked Chicken Murphy? Simply bake potatoes in microwave or boil whole until mostly done. Slice into large chunks and put them into a large roasting pan. Brown sausage before marrying with the potatoes. Dredge chicken pieces in flour mixture and brown in the same skillet. Remove and add to sausage mixture in roasting pan. Sauté your aromatics and add to the roasting pan. Follow the same preparation steps as the original version and bake for 45 minutes at 350 degrees. What’s the difference between Chicken Murphy and Chicken Scarpariello? Chicken Scarpariello is believed to have originated in New York and “Scarpiello” in Italian means “shoemaker or shoe fixer”. There are a couple of thoughts on how this dish got its name – the first idea is that this dish refers to “shoemaker style”, meaning that is a meager dish. Made with sweet peppers in a light wine sauce, this Italian-American chicken recipe is right up there in poultry greatness. There are many variations to the recipe, but it’s almost always made with just a handful of ingredients and a ton of flavor. Just like the Chicken Murphy, the Chicken Scarpariello is elegant enough for a special occasion but works just as well for a midweek treat. Although it’s basically a complete meal, you’ll definitely want to have some crusty bread nearby to dunk in the leftover sauce! Differences and similarities between the two dishes include the following. Potatoes: For the Chicken Murphy, the potatoes are cooked in the broth – at the end – until tender. Russets are the potato of choice for this recipe because they help to thicken the sauce. For the Chicken Scarpariello, fingerling potatoes are tossed with olive oil and S&P and roasted in the oven. Chicken: Chicken Murphy uses boneless breasts cut into cubes, while the Chicken Scarpariello uses bone-in, skin-on chicken thighs. 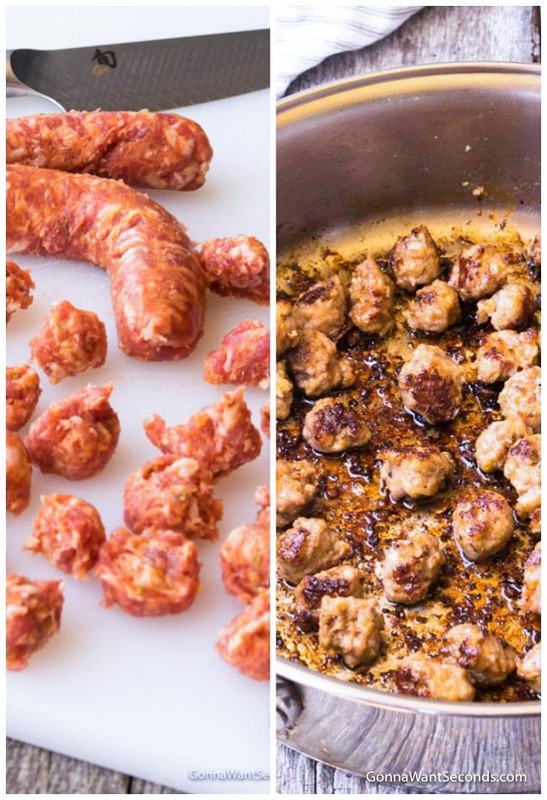 Sausage: Both use Italian sausage with the casings removed, but I think the Chicken Scarpariello seems to work better with the sweet version. 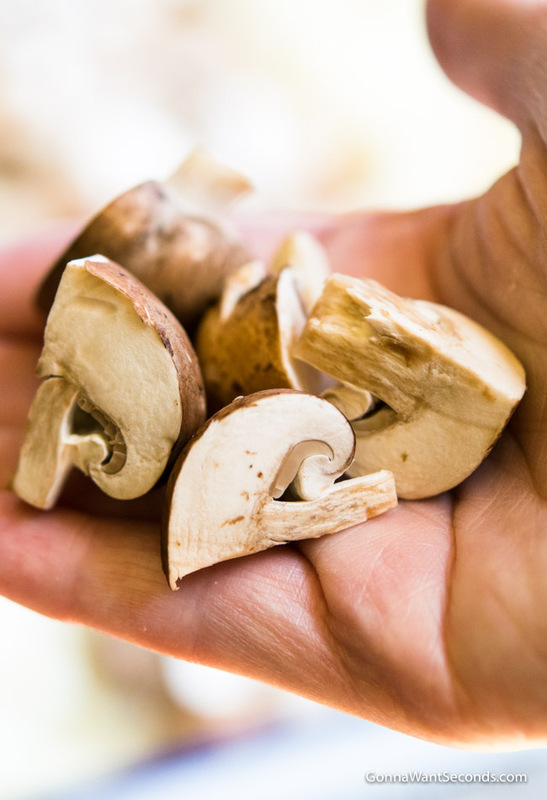 Aromatics: Both use aromatics – onion, garlic, bell pepper – but Chicken Murphy also incorporates mushrooms. 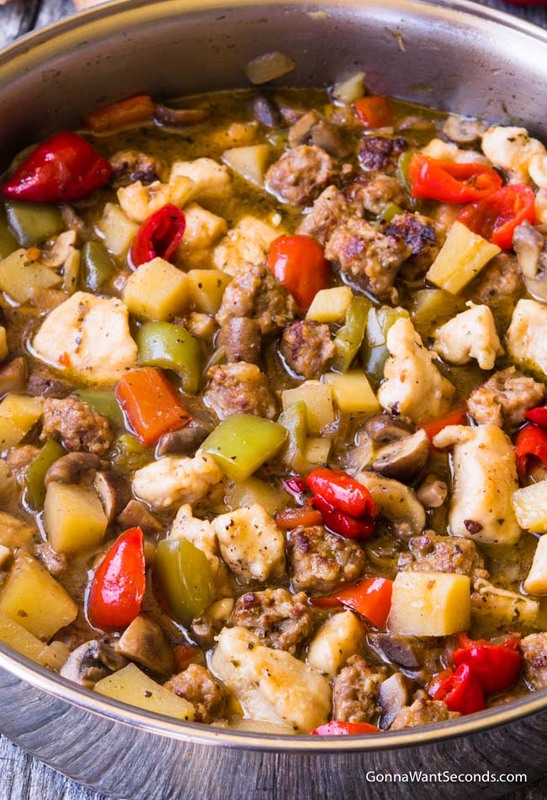 Sauce: Both use white wine, chicken broth, and pepper brine to rescue the tasty bits from the bottom of the pan and make some might yummy pan sauce. 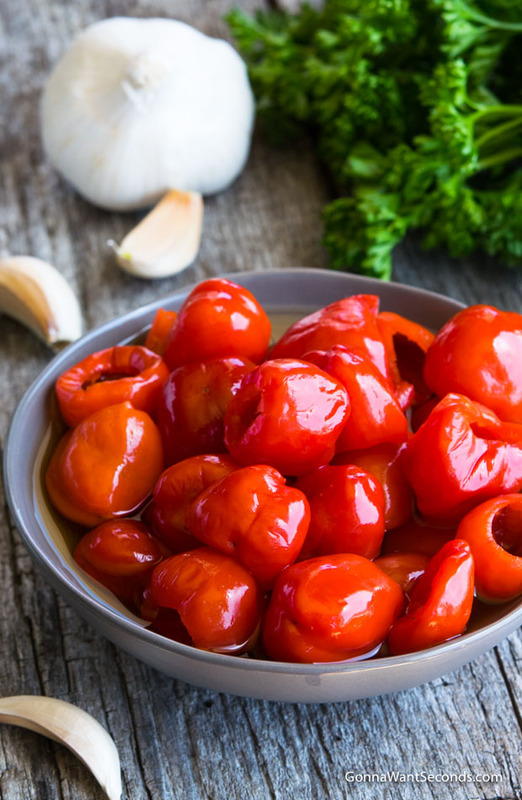 Peppers: Both use peppadew peppers and their brine. They’re a branded pepper originally discovered in South Africa. They are cherry tomato–size, and are often available hulled, seeded, and pickled in brine. You can find them at specialty grocery stores and online stores. If you can’t find them, cherry peppers are the best substitute. Preparation: Chicken Scarpariello is finished in the oven while Chicken Murphy is cooked completely on the stovetop. 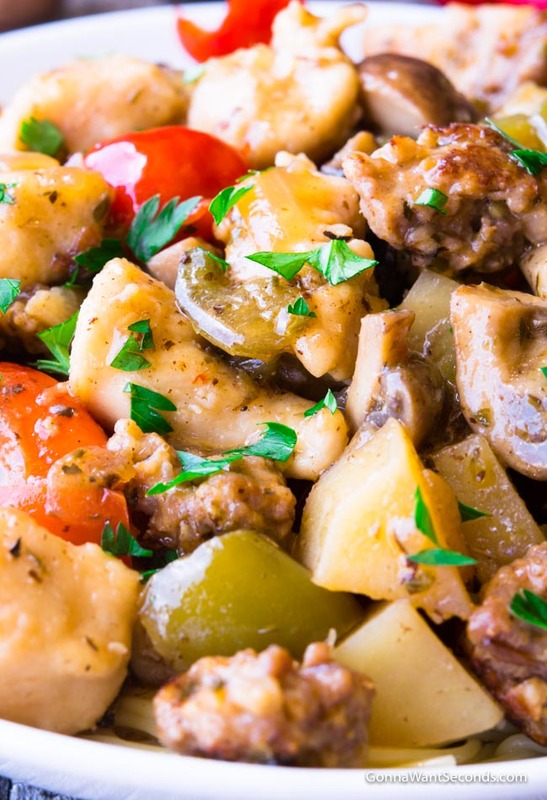 If you like these recipes, you’re sure to love another classic Italian-American favorite like Chicken Vesuvio, which is almost always prepared with a whole cut-up chicken. Another favorite is Chicken Française, an Italian-American dish consisting of flour breaded then egg-dipped, sautéed chicken cutlets finished with a sauce made of lemon-butter and white wine. The dish is popular in the region surrounding Rochester, New York, to the point where some have suggested the dish be called Chicken Rochester. Bring the heat (or not) – Most restaurants in New Jersey make this dish with cherry peppers. This creates a dish that is fairly spicy, so if you’re a fan of heat, cherry peppers are the perfect peppers for you to use in this recipe. My family prefers a little less heat, so I make our Chicken Murphy with Peppadew peppers. They are available in both hot and mild varieties. I find both varieties less spicy than the cherry peppers and the peppadews combine just the right mild kick with a lovely sweetness that adds a fabulous taste dimension. Pick your pasta – Since Chicken Murphy isn’t typically served with enough sauce to dress even half a pound of cooked pasta, I like to serve mine on a bed of cooked pasta that’s been tossed generously with olive oil and garlic. Angel hair or penne are my favorites for this dish because the flavors complement each other perfectly to make a complete meal. Potatoes – It’s important to use Russet potatoes in this recipe because they break down and thicken the sauce. Be sure to cut them in small, uniform pieces. If you cut them into large chunks you’ll have to extend the cooking time. 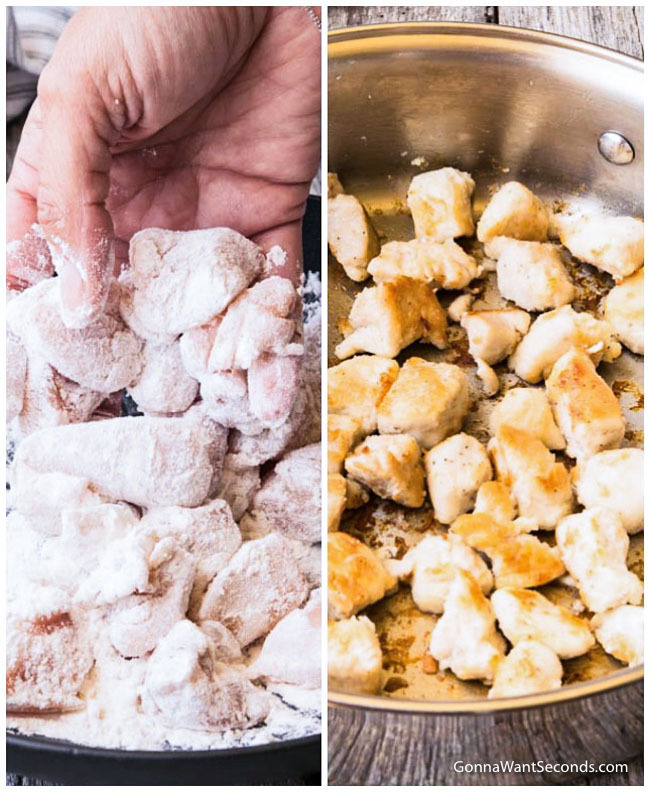 Season generously – When you begin, remember to generously season the chicken cubes with salt and pepper then dredged in flour, before shaking off the excess. Don’t skip the salt and pepper at this step. Flush the fat – Because the sausage renders a good amount of fat, you’ll need to pour off all but 2 tablespoons before adding the onions, red and green bell peppers and mushrooms. Wine rules – When adding your favorite white wine, remember, if you won’t drink it, don’t cook with it! Season chicken cubes generously with salt and pepper on both sides. Add 1/4 cup All-Purpose flour to a shallow bowl and dredge chicken pieces in flour, shaking off excess. Heat 2 tablespoon olive oil, in a large high sided skillet or Dutch oven, over medium heat then add floured chicken and brown on both sides. Remove to a plate and set aside. Add sausage to skillet and cook, over medium heat until its just browned. Remove sausage to the plate containing chicken and set aside. Remove skillet from heat and pour off all but enough fat to just coat the bottom of the pan. 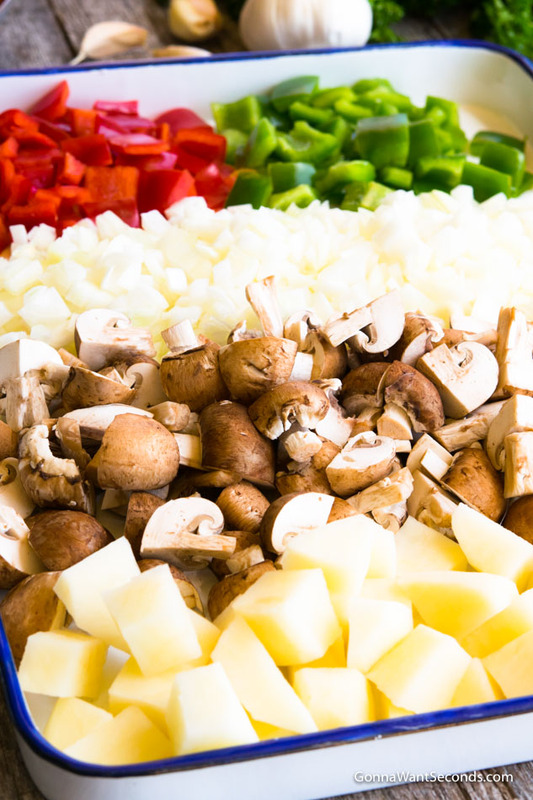 Add onions, red bell pepper, green bell pepper, mushrooms, and garlic. Cook on medium for 6-7 minutes. Sprinkle skillet with remaining 1 tablespoon flour and cook, stirring constantly, for 1 minute. Add white wine, and bring to a boil. Reduce heat and simmer vigorously, until the wine has reduced to a thick, syrupy consistency, about 5 minutes. Add peppadew brine, chicken stock, russet potato, 2 teaspoons salt, 1/2 teaspoon pepper, Italian seasoning, and Peppadew Peppers. Bring to a boil, then reduce heat and simmer, covered until potatoes just tender, about 20 minutes. Stir in butter and add browned chicken and sausage and cook until heated through and edges of potatoes are slightly crumbling. Serve over cooked angel hair pasta. Sprinkle with chopped parsley and serve. LOOKING FOR MORE CHICKEN FAVORITES? Smothered Chicken – Tender pieces of poultry, braised in this creamy condiment, turn mealtime into “mmmm” time. This Southern Smothered Chicken with Gravy will bring the family to the dinner table in a flash! Chicken Florentine – A rich, cheesy sauce, with leafy, green ribbons of spinach coat tender cheese-crusted chicken breasts in this simple but impressive dish. I’ve never eaten Chicken Murphy, so I tried this on my husband since I was looking for something different for our holiday party. He liked it and so did I. I than prepared this recipe for 40 people, and everyone loved it! I got several requests for the recipes. It’s great, and you can prepare it ahead of time! When do you add the peppadew peppers??? Thank you.